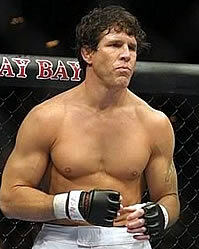 If you haven’t already heard, the sport of MMA lost a true warrior yesterday, Evan Tanner. Though not all details have surfaced, it appears that Tanner embarked on a trip to the desert, ran out of gas, attempted to walk his way out, and ultimately was overcome by dehydration in the mountains near Palo Verde, CA. The unfortunate circumstances of his death mirror the manner in which he lived his life both in and out of cage, which was loose and on the edge. Travelling in the desert alone is dangerous for even the most experienced of outdoors men, but Evan Tanner only did life one way. In the ring, Tanner was a throwback fighter, never one for a game plan he entered the ring with an “Anywhere, Anytime” attitude. His style in the ring screamed “Me Against the World” and he was very successful using it. He became the USWF Heavyweight Champ in 1997 and successfully defended his title seven times. He then headed off to the UFC, where he immediately faced Tito Ortiz for the light heavyweight title and lost, but he eventually took home the middleweight crown in 2005. This post if authored by Luke Bushwhacker and if you like MMA check back here for weekly updates from Luke and his brother Butch. Jose Canseco got debo’ed in a charity boxing event. 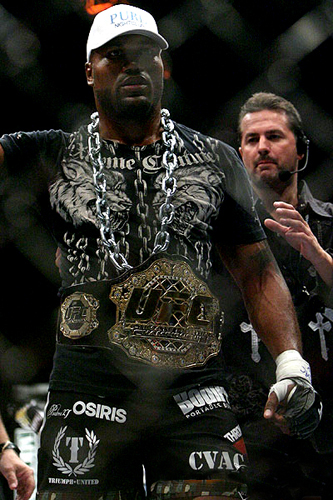 This really shocked us, Quinton “Rampage” Jackson was arrested for a hit and run. This guy seemed about as calm as a bull in a china shop. He was taken down by police gunpoint in Orange County, CA. Yes, that’s the O.C., see Kristen Cavallari. Anyway, he fled like O.J., and took off in Southern California, after hitting a car. Rampge drives a monster truck and he’s also a brain surgeon. He knew he’d go incognito, without anyone noticing his wheels, with his photo on the side of his 4×4. The police, see Chips, charged him with “felony hit and run and felony evading arrest.” This guy is amazing. This is a brilliant idea for how to build-out MMA, a sport that needs a major following. Bad press is good press for most, huh Rampage? Eventually, his car came to a stop and he was taken into custody at gunpoint. Cops took him to the Orange County Jail, but they determined he was “medically unfit” to be booked. Cops won’t say if he was high.